It’s easy to visit the Tikal ruins without a tour – from prices & transport to a complete temple guide, find out everything you need to know on our self-guided tour of Tikal, Guatemala. The Tikal mayan ruins are one of the top destinations in Guatemala – let’s take a look at the history behind these magnificent ruins. Tikal was first settled around 700 BC by the Maya civilisation and used an abundance of flint to grow their city-state. The flint was used to create tools and weapons that could also be traded for other goods. Although Tikal became a regional center for religion, culture, and trade around 250 AD, it wasn’t until another 100 years passed that they started dominating the Peten region in Guatemala. Jade wasn’t only used for tools and weapons, but also ornamental dental implants. Borrowing warfare methods from Teotihuacan, they quickly defeated nearby cities. Instead of traditional hand-to-hand combat, the Maya of Tikal would encircle their foes and throw spears. This method proved very effective. Tikal’s reign only came to an end when Caracol used the same techniques to defeat them in the mid-6th century. The 8th and 9th centuries saw a resurgence of Tikal power, which was when many of the remaining buildings were constructed. Like many Maya cities in the lowlands, the Tikal mayan ruins were mysteriously abandoned around 900 AD. Our ATM caves tour guide in nearby Belize speculated that this was due to a prolonged drought brought on by deforestation. Pick up a guidebook to help you plan your trip to Guatemala and also to brush up on some local history. Tikal was built layer upon layer, but most of what you see today is from the 8th and 9th centuries. We usually opt not to take tours due to cost, and we like having the freedom to go at our own pace. However, we actually recommend joining a group to learn interesting stories and facts about the Tikal National Park. Transportation is Q70 / $9.60 and a full tour is Q110 / $15.10 at Hostel Los Amigos so it only costs a fraction more. You can also book a more in-depth 8 hour tour with lunch here. Decide in advance as the guide charges more when at the Tikal Guatemala ruins. Not only will you learn more about ‘the rocks’ you are seeing, but they are good at spotting monkeys in the trees, and show you the highlights. You can then explore the remainder by yourselves, and revisit places to take better pictures. The downside, is that you will be jockeying for position with 30 other tourists. Don’t plan on taking any selfies with just you and the Tikal temples, or seeing an abundance of wildlife. The group simply makes too much noise, and doesn’t venture into the jungle much. Whether you choose to do a tour or go it alone we recommend purchasing travel insurance before any trip to Guatemala. We’ve been using World Nomads in our travels through 80+ countries over the past 12 years. It’s the best-value provider we’ve found in terms of price and coverage and we haven’t had any issues when we’ve had to make (fortunately) minor claims. You don’t get the time or possibility to take tourist free pictures when on a tour, unless you stay late. The base fare for visiting Tikal is Q150 / $20.60 and is not included in most tours. Sunrise and sunset cost an additional Q100 / $13.75 respectively. However, sunrise is often hazy and it rains in the afternoon during the wet season so neither is good value. Visiting two on-site museums costs Q30 / $4.10 extra. Tikal is the first ruins we visited where they charge extra for the museum. After paying your Q150 / $20.60 entrance fee, start down the path to the ruins on your left. Complex Q, built in 771 AD, is the first set of temples you’ll reach. It is also the best example of a twin-pyramid complex at Tikal, which the Maya built every 20 years to mark time and record important events. They built matching pyramids on the east and west of the complex. The north side contained a stela and altar, while the south side contained a building with nine entrances. If you’re interested in stelae, check out the UNESCO World Heritage Site of Quirigua. Altar 8 and Stela 20 in the North Zone of Tikal ruins. From the top of the east pyramid, you can see Temple IV jutting above the jungle canopy. The front of the base has nine plain stelae and altars. A more impressive combination is Stela 22 and Altar 10 enclosed in a small building on the north side. Tikal starts with a small bang at Twin Pyramid Complex Q. A short walk to the west leads you to Complex R.
This twin pyramid complex gives you a glimpse of what the twin temples looked like before being excavated. Scattered around are twin-pyramid complexes O nearby, P in the North Zone, and N by Temple IV. None of the pyramids are particularly striking, but the replicated stelae are worth a look if you’re exploring Tikal without a tour. None of the other Twin Pyramid Complexes at Tikal are excavated, but keep an eye out for the stelae and altars. In order to avoid the tour on our heels and attempt to see wildlife while it was still early, we decided to visit the Grand Plaza later. Follow the Maler Roadway to the North Zone. Along the way, you will see an engraved rock marking the capture of an enemy. Wow. Times have changed. They use to brag about kidnapping where now we do anything to hide it. The North Zone must have been significant as the roadways lead to both the Grand Plaza and Temple IV. Similar structures 3D-40 and 3D-43 are the most substantial buildings besides Twin Pyramid Complex P.
A second temascal (bathhouse) was discovered on this platform, but subsequently buried under further construction. The other significant finding was the discovery of The Man of Tikal that is now in a museum. Tours don’t venture to the North Zone of Tikal ruins since there isn’t much to see. Follow the Maudslay Roadway to Temple IV. The front was being restored upon our visit, but you can still climb to the top. Since Temple IV still has a lot of restoration to go, Tikal management has built a wooden staircase to the top. We recommend visiting in the morning, but the lighting on the other pyramids would be best in the afternoon. Hidden behind the vegetation and scaffolding is Temple IV. Take the staircase, built to preserve Temple IV, to the top for fantastic views. You can see all the other Tikal temples, and the Grand Pyramid from Temple IV. Heading east from Temple IV on Tozzer Roadway, you will pass Twin Pyramid Complex N before reaching Palace of the Windows. Take a look at Stela 16 displaying the king in 711 AD, and Altar V.
As you pass by Twin Pyramid Complex N, check out replica Stela 16 & Altar V.
The Palace of the Windows gets its name from being a structure built on a hill that has windows facing west. There is a path that takes you to the partially restored building. Inside the interconnected rooms you can see how Palace of the Windows got its other name, Bat Palace. There are tiny bats that hang from the ceiling, and occasionally fly around. Don’t expect to see anything from the windows, but there are great views on top. You can see Temple III between the moss-laden trees. Explore the Palace of the Windows from outside, inside, and on top. Temple III (60 m) is to the northeast of the Palace of the Windows, but is not restored and you cannot climb it. It is even difficult to see it through all the vegetation. Of more interest are Stela 24 and Altar 7 located in front of it. As you can see, or not see, the best view of Temple III is from the Palace of the Windows. Don’t skip Stela 24 and Altar 7, though. The Lost World (El Mundo Perdido) is significant, because it showcases structures built throughout Tikal’s evolution. Other plazas feature temples and pyramids that built on top of existing buildings, leaving only one visible architectural style. The Grand Pyramid and Temple of the Three Rooms (Templo del Talud-Tablero) are the two significant pyramids in the Lost World. Scale the Temple of the Three Rooms to catch a glimpse of the Grand Pyramid and the Lost World. Standing 32 m high, the Grand Pyramid has 80 m long sides at the base. Each side has a staircase leading to the top, which surprisingly features no temple. The main purpose was to act as an astronomical observation point – there is also an observatory at the Monte Alban ruins in Mexico. The Grand Pyramid has four staircases, and no temple. The other main building, Temple of the Three Rooms, is actually the first pyramid that catches your attention in the Lost World. The top consists of three rooms, and provides nice views of the plaza since you cannot climb the Grand Pyramid. Each room is in better condition as you move through all three. Plaza of the 7 Temples is a large rectangular plaza that abuts The Lost World. The west border is comprised of these structures. The north side consists of three adjacent ball courts that have yet to be excavated. This must have been like the PIP (picture-in-picture) of the Maya World, being able to watch three games being played at the same time. The south side is a ceremonial building. Left Side: Lost World wall. Top Right: Plaza of the 7 Temples wall. Bottom Right: Ceremonial building. More important are the 7 temples in a row on the east side. The center temple is larger, has a preserved roof comb, and a stela and altar in front. The large hill behind the 7 temples is actually the unexcavated South Acropolis. There may be 7 temples, but the middle one stands out. Temple V is unusual so be sure not to miss it. Measuring 57 meters high and having rounded corners, it was also built entirely during one period of construction. Only half of Temple V is restored, but it is our personal favorite. Isn’t Temple V just perfect? The Grand Plaza features Temples I and II, and both the Central and North Acropolises. This is the best restored section of Tikal. The Grand Plaza is where you need to spend your time exploring and taking pictures. 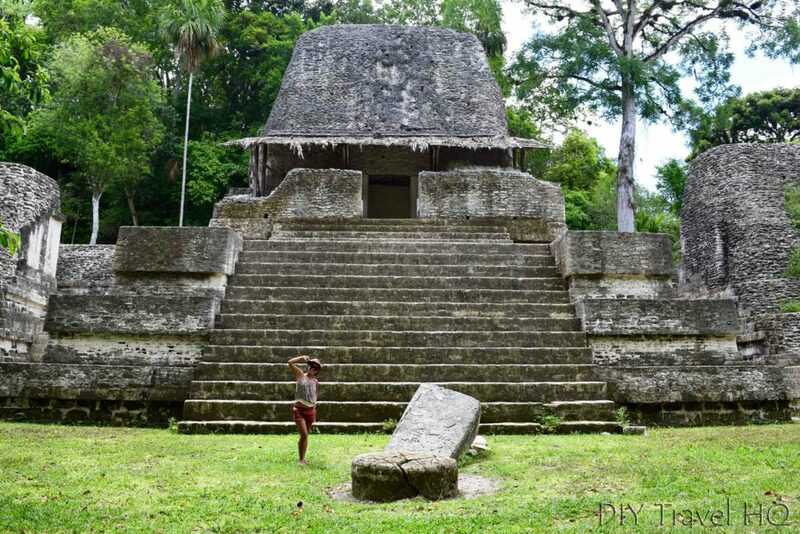 Coming from Temple V, you will come across Temple I (Temple of the Grand Jaguar) first. This was designed by King Moon Double Comb, but was actually built on his grave by his son. 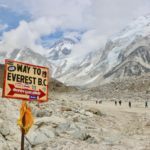 You are no longer able to climb this pyramid after two tourists fell to their death from the 45 m top. You can, however, still climb the 38 m Temple II (Temple of the Masks) via a wooden staircase in the rear. From here, you can see Temple I, and both the Central and Northern Acropolises. Don’t forget to turn around to see the masks lining the top of the temple. You can still climb Temple II for a great view of the Grand Plaza. Two rows of stelae and altars line the front. They depict the dynastic sequence, and record major events. The most detailed section is in the center, and has stone carvings unearthed from previous construction. It is also possible to do a loop by climbing up either side, and returning down the other. There are great views of the Grand Plaza from the top. Take a look inside the ruins with a partial excavation of previous construction. The Central Acropolis on the south side functioned as residential and administrative quarters. The palace consisted of mini plazas and small rooms that housed nobility. Evidence of changing configurations suggests meeting the demands of various family sizes throughout the years. The Central Acropolis is fun to explore with narrow paths leading to hidden plazas. There is a small ball court next to Temple I in the Grand Plaza. You may also be interested in checking out the ball courts at the El Tajin ruins in Mexico. Imagine playing for your life in the Grand Plaza Ball Court. Temple 38 stands at a crossroads linking the Grand Plaza with Group F, and the South Acropolis with the East Square. The front façade is completely covered with earth and appears small, but the excavated rear tells a different story. Don’t bother visiting the East Square since it has yet to be excavated, and Group F has little to see. So much excavation still needs to take place at Tikal. How the archaeologists prioritize the work is a mystery. The Acanaladuras Palace was our personal favorite complex since it was completely different, and free of other tourists. You enter the courtyard through a tunnel, and the walls on the other side are comprised of columns that don’t quite fit. It really feels like another set of ruins than Tikal. Visit the Acanaladuras Palace on your way to Temple VI. Temple VI, or Temple of the Inscriptions, is the last point of interest before returning to the entrance. The temple is out of the way, but worth it. Temple VI has the longest hieroglyphic text in Tikal, located on its rear. Stela 21 and Altar 9 are also worth a look in the front. Don’t miss Temple of the Inscriptions with Tikal’s largest collection of hieroglyphs, a stone face guardian, and stela with altar. What separates Tikal from other Maya ruins is the combination of partially restored pyramids, and a healthy amount of wildlife in the jungle. Expect to find spider and howler monkeys, coatis, peccaries, woodpeckers, toucans, hawks, bats, and turkeys – you have the time to spot wildlife when visiting Tikal without a guide. We let you know where we saw them just in case they frequent certain locations. The coatis at Tikal are no longer afraid of humans. Spider monkeys tend to be the monkey that will catch your attention as they swing from branch to branch. We saw several spider monkeys by the ceiba tree near the entrance, another group of spider monkeys around Temple 38, and also in the large tree in the center of the 7 Temples Plaza. Keep an eye out for movement in the trees. You may just find a spider monkey. Howler monkeys are more likely to be heard than seen since they don’t tend to move much. We heard and spotted them on the trail before arriving at Complex Q.
Spider monkeys are also usually spotted at the Community Baboon Sanctuary in Belize. We saw a peccary on the far side of Complex R, and on the Complex O platform. Depending on their range, you might see them in the early morning as well in this area. They seem to resemble an oversized rat that hops like a rabbit. Ever see an oversized rat that hops like a rabbit before? Coatis are common sights around Temple IV – you’re highly likely too see them even without a tour or guide. They are scavengers that resemble a raccoon with a long nose. They are probably attracted to the bathroom, and snack stand located nearby. Although you can bribe these fur-balls with food, don’t! They may then become aggressive towards humans. We also saw several woodpeckers that were spot-on for Woody Woodpecker clones pecking away at the trees near Temple V.
The ocellated turkery at Tikal is an oddity as it has feathers similar to a peacock. Watch it strut around like it owns the place. We saw ocellated turkeys behind the 7 Temples, and near the museums. This turkey can be so beautiful it almost makes me not to want to eat them. Perched on a tree in front of Temple IV we spotted a hawk waiting for prey. There were also toucans nearby, but quickly flew away. I’m not sure if I should be thankful or insulted that I don’t look appetizing to the hawk. Tikal is flush with wildlife for a touristy area, but there are a few unique plants to look out for too. These include the ceiba tree, strangler fig, and escobo palm. Immediately upon entering Tikal is the giant ceiba tree on the right side of the path. Ceiba trees are easily recognizable by their height, and thick branches at the top. The strangler fig is always fun to see it wrap itself around a tree for support, only to smother it later. The escobo palm is also interesting since the Mayas used the thorns to catch fish. Watch what plants you lean on as you might be in for a surprise with the escobo palm. Surprisingly, Tikal did not have many mosquitos despite being rainy season. However, they did have huge beetles, and termites on the path back to the entrance. These termites couldn’t have found a better plant to eat? The easiest way to get to Tikal is by the shuttles that tour companies, hotels & hostels all operate from Flores, the base town for visiting Tikal. Take the 4:30 am shuttle to arrive by 6 am, and start exploring Tikal by 7 am. This gives you the best chance to see wildlife, avoid rain, and keep cool. Return times are at 11 am, 12:30 pm, and 3 pm. Aim for the 12:30 pm shuttle, which should give you ample time. 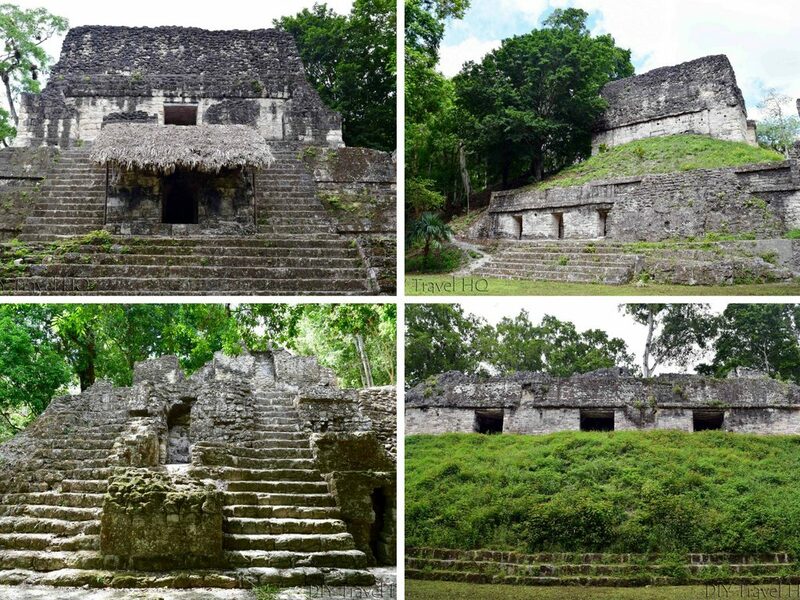 There are 3 places to stay within the Tikal National Park but outside the actual ruins. They are all around 1 mile from the entrance. Jungle Lodge Hotel is the nicest option and the closest to the entrance. They also have a pool restaurant bar and free wifi. There are 5 types of rooms ranging from standard to suites. You can get rooms for as low as $45 up to $180. It’s also listed online as Hostal Jungle Lodge Tikal but they’re the same place. Tikal Inn is the furthest away from the entrance but still within walking distance. There’s an outdoor pool restaurant bar and free wifi in public areas. There are 4 types of rooms ranging from ‘Ranchon Rooms’ to Junior Suites from around $40-100. Hotel Jaguar Inn has a restaurant cafe bar and free wifi in public areas. Accommodation is in bungalows for up to 4 people starting from $70. You can also rent a tent with mattresses pillows sheets and towels or bring your own and camp on the grounds for $4. Camping is also available at the Tikal National Park Campground. According to a recent Tripadvisor review it’s Q50 / $6.55 to camp with your own tent or Q70 / $9.15 to hire a tent. Hammocks are Q50 / $6.15. You can’t make a reservation in advance so get to the park early to secure a spot. Most people choose to stay in Flores which is just over 1 hour from Tikal. Here there are many more accommodation and food choices along with things to do. There are over 10 budget guesthouses and hostels in Flores with dorm rooms starting from Q50 / $6.60 and private rooms from Q115 / $15. We stayed at Hotel Mirador del Lago which was pretty good. The most popular hostel is los Amigos for good reason. We popped in to check out their tours and it’s a really cool place with a large tropical common area. This is the best choice if you want to socialise party or meet other people. Hostel Yaxha is more low-key but also highly rated. All hostels and hotels run tours everyday to Tikal and around. Book the tour, and they pick you up at your hotel. 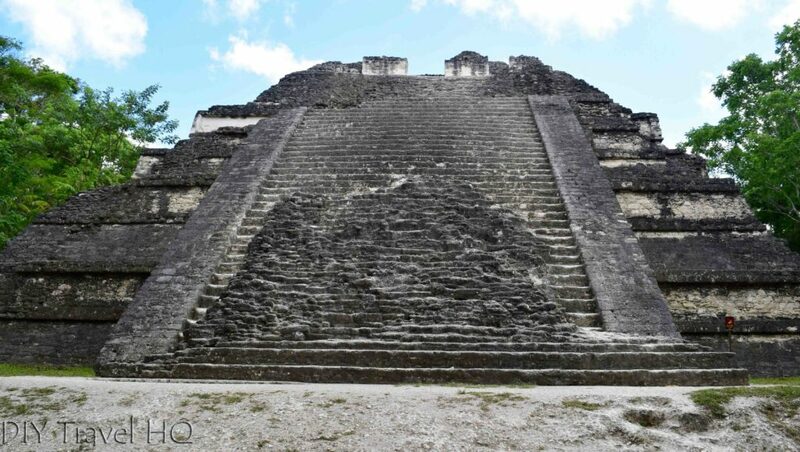 Did you enjoy reading our guide to Tikal? What did you think of Tikal and how does it compare to other ruins you’ve visited? I’ve seen Chichen Itza and Tulum. Would love to go back and see more Mayan ruins. Thanks for the post. You are welcome Ugo. It is always amazing to look back at past civilizations and wonder what life must have been like. Tikal is nice to explore, and soak up the ambiance. The crazy part is that every ruin we have visited still has so much work to be done. They always have statistics stating that 80-90% remains buried or something out-there. Tikal is no different, and will continue to improve with funds from tourists. Wow, this was a very comprehensive post. You really did a nice job of providing all the information one would need including what we could expect to pay. I enjoyed visiting the pyramids outside of Mexico City and these appear to be equally as intriguing. Thanks for this guide. No worries, Christine. Are you referring to Teotihuacan? The size of those temples is amazing considering you can see the entire area from the top of the Pyramid of the Sun, or Moon. We prefer Tikal more for the variety, carvings, vegetation, and wildlife though. Thanks for such an informative post! It must’ve been awesome to see so many different types of temples along with the monkeys and wildlife 🙂 I went to Tulum and Chichen Itza in Mexico years ago but I always knew there was more to see than just those two spots. Will have to return to this part of the world some day! There are a lot of temples scattered around Latin America, with Mexico having the best restored in our opinion. If you visit the Yucatan again, Uxmal is amazing. We also wanted to visit Calakmul, but couldn’t justify the price since it is so remote. so much to see in Tikal! I usually like joining local tour so that we can listen to interesting stories, but 30 tourists in a group is huge … I will need to think about that! Cat, that is just the cheapest and most popular for backpackers in Flores. You can always pay a bit more and get a smaller group. Just check with the tour agency to see the maximum number of people they allow for each tour. Such a lot to see in Tikal, I think I will have to set aside a couple of days or more for this place. 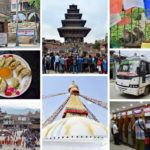 A comprehensive guide, I will come back for the notes when I plan a visit there. Hopefully that will be soon. One day is more than enough to see it all. If you want to see sunset during the dry season, consider going after 3 pm so you can visit the next day too for free! I’m not sure how much accommodation is, but you can camp there if you have your own equipment. Let us know what you think when you go.